King of Cups Tarot Card Meaning - All Explained HERE! The King of Cups is the fourteenth card in the Cups suit. Initially, as a King, you’d think the King of Cups is a mainly masculine card, but overall as Cups deal with emotions, it is quite a balanced card. The King sits in a throne surrounded by water, holding a cup and a scepter in his hands. The King of Cups represents good advice, thoughtful creativity and maturity. Past – The King of Cups in the past position can represent you in the recent past. You may have been the arbiter in a conflict or argument, or it could refer to someone close to you who was; usually a male in a position of power. These events are still affecting how your life is being played out. Perhaps a decision was made, and you are still following it. It could also represent a time in the near past where you were very emotionally mature, perhaps when you thought about a choice or situation and acted on your good sense, instead of impulse or on negative emotion. Present – The King of Cups in the present position has a few meanings. Firstly, you may have to make a tough decision. It’s best to think it over and take the more ‘adult’ choice, rather that just jump in and choose what seems to be the most energetic and spontaneous. Secondly, it could mean that you’re about to come into contact with somebody who is able to help you greatly. You should really listen to what they are going to say. In life right now, you might be doing well, and feeling as though you are in control. Your plans should come to fruition without an external influence. Future – The King of Cups in the future position suggests you should actively look for somebody to help you along the way. A business partner or a friend to help with studying or general life issues. Look for someone older than you, especially if you’re currently in a rut. In the long term, the King of Cups can also mean a happily balanced life, full of intelligence and stimulation. Work / Education – The King of Cups in regards to work or education has somewhat a similar meaning to the Queen of Cups. You may find you need to impress a male boss, supervisor or teacher. It isn’t about showing yourself up, but just making them happy that you’re able to take care of yourself. In regards to education, if you don’t understand something, it’s helpful to just go and ask your teacher about it after class to set things straight. Don’t leave classes unsure of what to do. Romance – The King of Cups in romance is a good sign in regards to love. If you’re looking for someone new, expect to meet a very mature and intelligent prospective partner. You’ll look up to them in a few ways, and they’ll be very decisive. If you’re in a relationship, it could mean that the card is representing you. Are you making good decisions, or any decisions? Don’t start putting off making a choice. Act. Friends – The King of Cups in regards to friendship can mean you’ll make a new friend soon, if you’ve recently moved or joined a new group, expect to make friends with the ‘leader’. It can also mean that you might take on a larger role in your current group of friends; making agreeable choices that affect everyone. Be prepared to give out advice to friends if they ask for it, and as always been cool, calm and collected. It’s not a time to gossip, but help your friends out as if you were seeking advice. Money – The King of Cups in regards to finances can mean that you’re going to need to sit down and sort out your money situation. Since the key word is ‘decision’, you might need to cut out a luxury to get by. To be blunt, if you have any costly addictions, look into cutting them out soon. You need to act like the best version of ‘you’ that you can, especially when it comes to money. Health – The King of Cups, again is a good sign in health. Don’t ignore what your body is telling you. If you’ve been putting off going to the doctors, now is the time to go. You might also currently have an unbalanced diet or active physical life. Is there anything you’re missing out on, is there anything you desire? make your life balanced. Consider joining a gym on a trial basis. Spirituality and Mentality – The King of Cups is a balanced and compassionate card. Take some time to think about how balanced or unbalanced your life is. If you have too much, can you give some away? Do you need a little extra in another part of your life? You should be in, or heading towards a relatively calm period of your life. When you’re content, it can be good practice to help others up to your level. 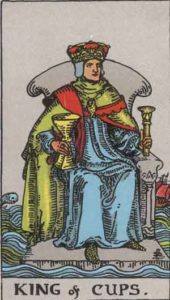 In reverse, the King of Cups can represent a level of emotional immaturity. You may be unsure what to do with your current situation through either greed or ignorance. We gain experience in how to deal with situations in our life only by experiencing them the first time. Try not to hurt how others feel, especially if you have some sort of say in the matter. Even the strongest of us can let our emotions get the better of us; jealousy, anger and hatred can overwhelm a person. If you’re uncertain of your own feelings, then take a break, keep some distance and work it out. As a Yes or No question: Yes, but isn’t it one of those questions that you already know the answer to? We’ve selected live tarot readers to give you a FREE 3 Minute interpretation of The King of Cups! Scroll through them below and pick your favorite one.